It is now time to seek the oracle of all knowing weather predictions for the winter: the wooly worm. 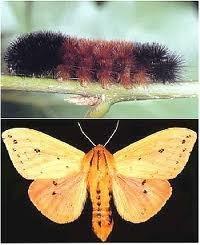 He/she is to be viewed inching along in caterpillar form with the orange color and black band looking for a place to curl up for the winter, emerging in the spring as a dull gray moth. When “Wooly” darkens his coat of fuzziness it is an indication of a colder winter. Dark colors attract sunrays for warmth. This year he is as dark as the ace of spades. Ergo: A cold winter. Of course not everyone wants to base their winter on the Wooly; modern weather satellites, advanced computers and formal meteorological training leads us to arguments in the weatherman’s logic of predictions beyond 12 hours-the same as it was fifty years and back. The current accepted media weather forecast is a wet, cold winter in the North East. Well it is usually wet and cold there, but this winter should sweep down the coast and be as grim as the 1970’s complete shutdown. This is not just a usual Prepper article; it gets a bit deeper that may influence you to make some early decisions on fuel. It seems as if the refineries in the US are shutting down, as reported by Daily Markets, October 7th. As would be expected their rationale is they are not making any money. From the bottom of the pile where I sit #2 Heating oil is $3.59 a gallon. People who still have an oil furnace are only buying a hundred gallons at a time, or shifting to wood heating. New York, the largest buyer of heating oil, will not be happy people this winter as prices on available stock futures by February will soar UP and UP. Wooly says: since it is cold in New York State your option is spend the money for oil, or go to Florida this winter. The real problem is not heating oil per se but a bigger picture. Recall that heating oil and diesel oil is a Universal oil-separated only by a chemical dye mixed for taxation purposes. This means that the diesel trucks on the road that deliver food and material needs this winter will be faced with a higher cost of running those trucks and may also just shut down since it is independent truckers that have to bear the expense burden. Yes, prepping now for food stocks and alternative heating is warranted. I would think Homeland Security would be on top of this issue as there will be only one oil pipeline coming up through the south to supply everyone’s needs and that of course will be subject to all sorts of issues; like shutting off, damage etc. This is a perilous situation and not to be taken lightly. Presently I have arranged with a Roanoke Va. firm: Safety Clean, an oil recovery business at 1-540-890-4478 to pump out one of my used motor oil storage tanks which they pay me X cents per gallon to reclaim the old oil. Once this is completed I plan to fill the 270-gallon tank with Universal oil for a future investment in running diesels on the farm, or my ancient oil furnace. I probably will help out my neighbors. I know for a fact that locally, farmers, backhoe businesses, and others who use diesel have been in a bind for the high cost of diesel fuel to run their equipment and in many cases can not break even. So when your backhoe man wants to charge twice what he did last year- look at the situation. This is the “Trickle Down Economy”. When the grocery store shelves are bare think of those refineries that are shutting down like the rest of America. Things are changing and not for the better. Potatoes and things of interest	Rural Sanitation- The Septic Tank and Leach field. I also have been watching animals for a long time. I noticed that my cats are growing rather thick fur this fall. (We live in Virginia,) With the info and analysis given here, I can only say it’s going to be quite “interesting” getting to work this winter. I’m glad to have discovered your website. I’ll come visiting here again.